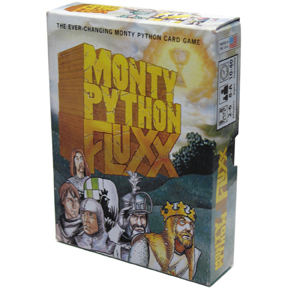 And now for something completely different�it�s Monty Python Fluxx! Yes, that crazy card game where the rules keep changing has joined forces with Monty Python to create the looniest card game ever! Help King Arthur and his Knights find the Holy Grail. Bring a Shrubbery to the Knights Who Say Ni! Lob the Holy Hand Grenade at the Killer Rabbit with Nasty Big Teeth! Just do it quick, before the Goal changes again!